Mia and Sienna love to hang out and have fun at the LEGO® Friends Heartlake City Playground and take puppy Pippa with them! Scale the climbing wall to get up to the tree house and play hopscotch way up high. Then whizz back down to the ground on the slide and explore the rest of the playground. Test your strength on the monkey bars and see how fast you can make the merry-go-round turn. Have a go on the seesaw then chill out on the swings—the perfect place for a catch up with friends. Price is 8% above the initial Lego retail price! This comes down to 14.50 cent per brick. 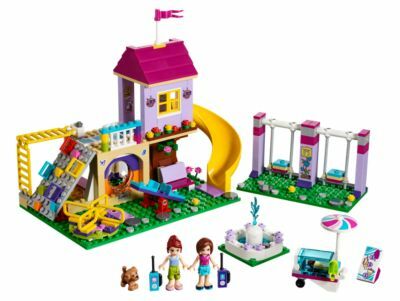 The Heartlake City Playground (41325) Lego set is no longer directly available from the sites below. However, 3rd party partners of these sites might still have the set available. Alternate description Have fun playing at Heartlake City Playground with Mia and Sienna! Includes Mia and Sienna mini-doll figures, plus a Pippa the dog figure. Features a tree house playground with slide, climbing wall, swings, merry-go-round, seesaw, hopscotch, monkey bars, benches, fountain and an ice cream cart. Meet up with friends at the playground and have fun pushing the swings, spinning the merry-go-round and working the seesaw! Climb up the climbing wall to the tree house and enjoy the view from up high. Buy an ice cream from the cart and enjoy it as you relax by the fountain. Playground measures over 7” (19cm) high, 9” (23cm) wide and 4” (12cm) deep.